This test method is used to determine the amount of water required to prepare hydraulic cement pastes with normal consistency, as required for certain standard tests. The percentage amount of water which is required to prepare standard cement paste when vicat plunger penetrate under 10±1mm reading is known as standard consistency or normal consistency cement paste. Electrical Balance, Vicat Apparatus, Spatula, Trowel, Mould, Pot, Distilled Water and Ordinary Portland Cement etc. Take ordinary Portland cement of 500 grams and weight it in the electrical balance. 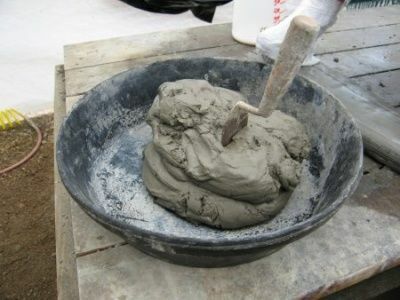 Now take a pot and put the cement and water in it and mix with the help of trowel. Form the cement paste into a ball by hands then Press the ball into the larger end of the conical mould, held in the other hand by completely filling the mould with cement paste. Tight the plunger at the level so that it touches the surface of cement paste then set the movable indicator of vicat apparatus to upper zero mark of the scale and gently releases the plunger to cement paste to penetrate for 30 seconds. Note the penetration of plunger into the cement paste. It should be 10±1mm if not then repeat the whole procedure by changing the percentage amount of water in each trial. The mixing of cement should be done in non-porous glass plate. The plunger needle should be clean every time before its penetration in the cement paste. Vicat apparatus should be free from vibration during the penetration.